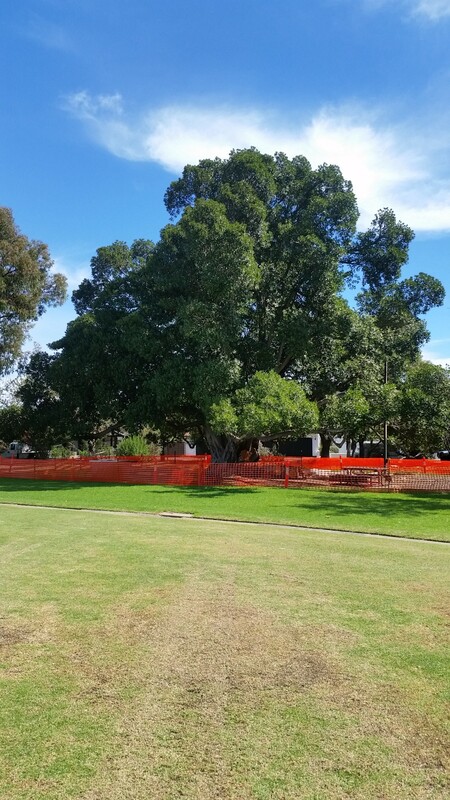 Staff and I met today on site at Goodwood Oval as part of an exercise to resolve where to from here for the Fig Tree. First up I can confirm that the tree will remain. It has had it’s necessary trimming and now we need to ensure now that we are definitely keeping the tree we have done what we can do to keep the area underneath safe. A Hazard Management Assessment has revealed that we must do what we can to dissuade people from congregating under the area. In other words we will be looking to simply restrict thoroughfare and the congregation of people under the tree, not prevent access. What is likely to happen as a first step in the process is to replace the temporary hoarding with a permanent single rail fence. This fence will not follow geometrical lines and will provide access points that will allow people to fetch lost balls etc. Permanent symbolic signage (designed around young children being able to read the message) will be strategically located to prohibit climbing of the tree. The next step will be to reposition the barbecue and the seating to an area outside the drip line of the tree. We are looking at the area to the north of the tree but need to do some research as to where power is (to feed the barbecue) and sprinkler points to determine the location of the barbecue. Apparently GAP water which is used here is not allowed near barbecues. The seats will be positioned under shade with ready access to the barbecue. The area both inside and outside the drip line is earmarked for some landscaping with with planting that is suitable for watering with GAP water. 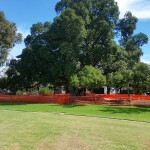 As part of another project we have for the Oval surrounds we will be planting 12 new trees. Two of these will be Figs, I presume Port Jackson but maybe Moreton Bay. With these trees taking some 20-30 years to mature we are of the belief that planting two more now will provide an opportunity for one to replace this one, in time, as a grandfather tree for the Oval.